Accenture’s Interactive Wall is a scalable in size, networked, high resolution, touch screen interface. It gives users the "big picture," whether in a strategic decision-making context or a retail and advertising environment. 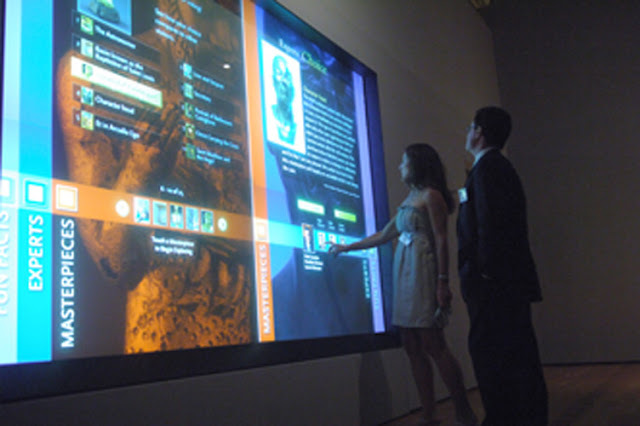 The Interactive Wall has a role to play in strategic decision-making, as a command or nerve center for controlling operations. The "big picture" view draws decision-makers together, whether in relaxed debate around the screen in an office or tuning in through wireless connections via locations in the far corners of the globe. The Interactive Wall fosters collaborative practices, allowing data to be manipulated and quickly assimilated by broad groups of people in diverse locations. By mimicking the Web in its ability to track usage patterns and user preferences, the Interactive Wall offers personalized, targeted, information while integrating with other networked or mobile devices to create innovative solutions for users and organizations alike. The Interactive Wall's super-sized, physical screen combines with Accenture's groundbreaking patent-pending software to deliver greater insight, faster. Whether applied to advice consumers about products and services or employed to act as a nerve center for command and control operations, the interactive wall is more than just a pretty face. Read about the technology behind the Interactive Wall and how industries can realize benefits from its massive scale and versatility. Developed by Accenture Technology Labs, the Interactive Wall is hardware agnostic and massively scalable in size as well as being low maintenance. Different types and sizes of screens from a variety of vendors can be used. The hardware that powers the software player for the interactive wall can be any type of Microsoft or Intel-based server. High-end graphics cards are required to drive displays, along with high-resolution cameras and off-the-shelf software to provide the touch capabilities. The touch screen can be rugged enough for outdoor use or rendered child-proof for use inside. Accenture has developed patent-pending software that developers can use to build custom applications for the Interactive Wall. 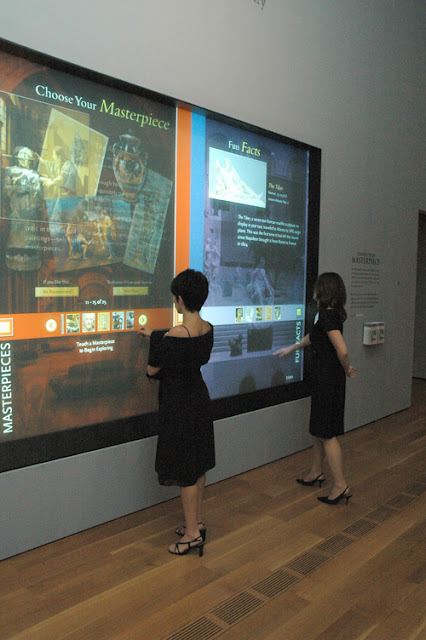 Louvre Atlanta used Accenture’s Interactive Technology to explore the changing nature of masterpieces, with a 7-by-10-foot touch screen that enhances user experience at “The Louvre and the Masterpiece” exhibition. The wall enables visitors to select their favorite “masterpieces” from the works on show—and then compare their selections with those made by other visitors as well as curators from the Louvre and High. Based on the visitor’s preferences, the wall offers recommendations on pieces that may interest them from the High’s permanent collection. 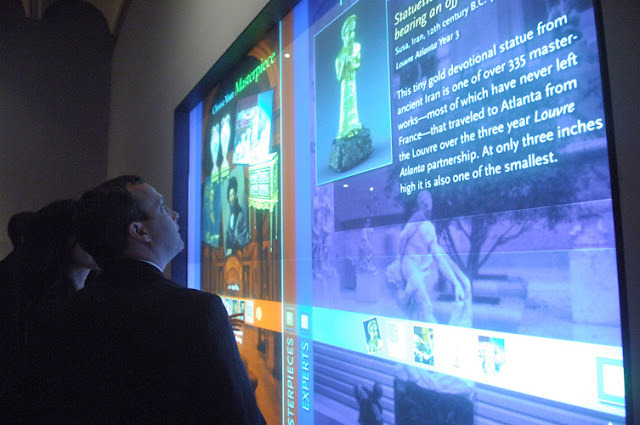 In this way, Accenture harnesses the power of technology innovation not only to enhance the visitor’s experience but also to provide a way to capture and manipulate information that could help museum curators and art critics understand viewers' trends. Visitors will also get a chance to experience another technology innovation from Accenture: The Forgery Game is a new, interactive game that presents the visitor with a mystery to solve. The game not only educates, but provides a fun, engaging experience as players investigate a possible forgery by comparing two pieces of sculpture linked to ancient Egypt. The game can be played at four 32-inch individual touch screens kiosks along-side the works of art in the exhibition. 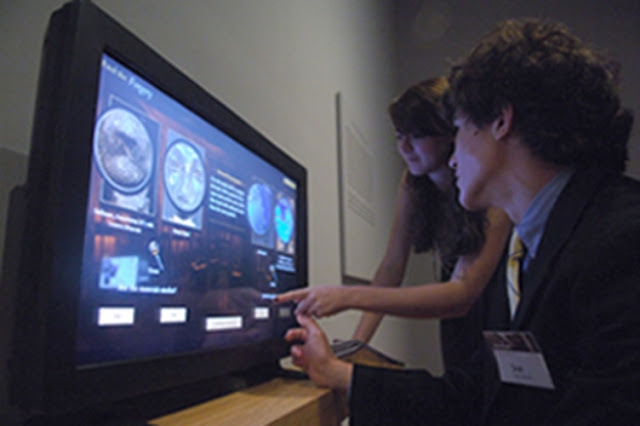 Visitor can view and analyze the same data collected by the museum experts and arrive at their own conclusions.